The flip side of the Trump administration’s downgrading of the State Department is the insertion of Trump’s daughter and son-in-law into key foreign policy positions. Perhaps the failure to appoint professionals to positions under Rex Tillerson is deliberate. Lacking deputy and under secretaries provides openings for Ivanka Trump and Jared Kushner, notwithstanding that neither of them has the remotest experience in diplomacy. Here you have two family members with offices in the West Wing of the White House—one who sells fashion items, the other who wheels and deals in real estate—with full access to classified materials despite having undergone no vetting and having never worked in government. 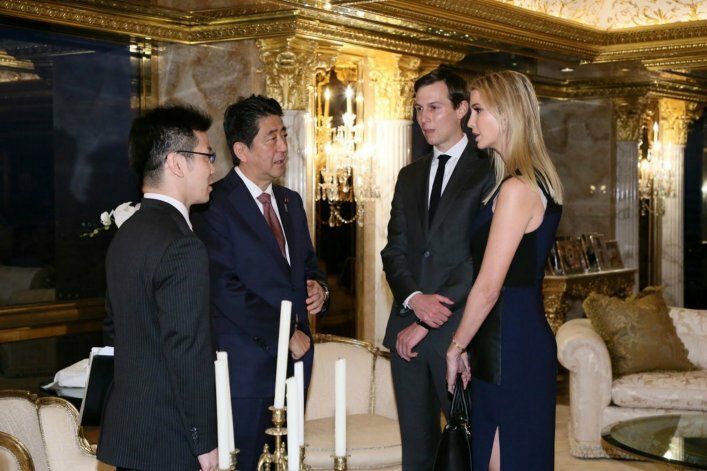 Jared advises Trump on everything from the Israel-Palestine struggle to China policy, and Ivanka sits in on discussions with foreign leaders such as Abe Shinzo, Justin Trudeau, and Angela Merkel. So while Tillerson travels abroad, are Jared and Ivanka minding the store? Has disrespect for experience and expertise gone that far? You would think Tillerson and others at State would be disgruntled, yet they remain silent. Why isn’t anyone, for example in the Senate, standing up and making a fuss about such blatant and embarrassing nepotism, not to mention potential conflicts of interest? It’s bad enough that Trump’s sons are in charge of his real estate empire, spreading abroad the gospel of how to profit from high office and having their travel subsidized by the US government. But having children play at high-stakes diplomacy surely leaves foreign officials wondering about the reliability and sensibility of the United States. All I can do is shake my head in amazement and dismay. This is not my government. I think the press is missing the link of Trump and his familyâs business interests with Russians and the mafia. Russian interests are not just political but also economic. Some big money has been flowing into Trump deals from the Russian mob/Putin connections. The overall Trump goal seems to be to reverse the sanction under the law and Obama ex. Ordersâ¦. Have you read the book Red Notice? It outlines the crimes committed by Putin and the Russians kleptocrats. Some recent news suggests that a great deal of Russian money has been laundered through Deutsche Bank and banks in London. Trump has a huge debt to Deutsche Bank. Some of that laundered money evidently has found its way into Trump properties in Florida at greatly inflated prices. Interesting. Follow the money.